Each year the faculty of the Department of Aeronautics & Astronautics recognizes outstanding contributions to aerospace engineering and the nation's progress in air and space by electing a Distinguished Alum. 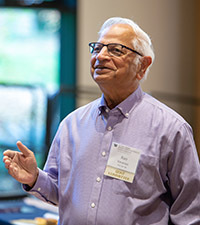 Dr. Rao Varanasi (A&A PhD 1968) has been named the 2019 A&A Distinguished Alumnus. He will accept the award at the departmental graduation ceremony in June, where he will also serve as the keynote speaker. Having worked over 45 years at The Boeing Company, Dr. Varanasi held various positions in the fields of research and development in structural engineering, computational mechanics, analytical modeling of engineering systems, and management of military and commercial airplanes. Most recently, Dr. Varanasi served as Chief Engineer for Structures and Aging Fleet in Boeing Commercial Airplanes and served as a technical leader and engineering liaison for aircraft structures for the Federal Aviation Agency and the European Aviation Safety Agency before retiring. Dr. Varanasi has been a great contributor to A&A over the years as well. He is an affiliate professor in the A&A Department as well as a member of the A&A Visiting Committee, which reviews undergraduate and graduate programs and curricula, and faculty requirements to make recommendations for a broad set of strategic goals for future growth including increasing department’s academic ranking in five years. He also serves as Chair of the Diamond Awards Committee for the College of Engineering.